Your membership to Cleaves Law Library is welcomed. Not only do members receive a wide range of benefits but this valuable contribution to the library helps defray the expense of maintaining a high quality of legal materials and specialized reference assistance and services. All members of the bar are eligible for membership. Dues are assessed on an annual calendar year basis. For further details, contact the library at 207-773-9712. The Nathan and Henry B. Cleaves Law Library exists to serve in a professional, efficient and modern manner, the educational, historical and legal research needs of its members, and to provide access to such information to the general public, utilizing the most modern technology possible, and to preserve and maintain legal materials and artifacts that are in the Library抯 care. The Library strives to maintain a complete and up-to-date collection of materials in an appropriate physical setting, and to deliver competent, professional research assistance that allows Library patrons to make full use of the Library抯 resources. The Library will be responsive to the changing needs of its patrons, and provide a cost-efficient means to share legal resource costs and resources for the benefit of all. 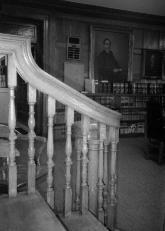 The Nathan and Henry B. Cleaves Law traces its roots prior to 1811, for in that year an agreement was signed by several leading members of the bar stating that whereas prior arrangements for collecting funds for the increase and preservation of the "Cumberland Law Library" had failed, subscribers agreed to pay $2 annually. This agreement was signed by Prentiss Mellon, who later became the first chief Justice of the Maine Supreme Court, Simon Greenleaf, Samuel Fessenden, Stephen Longfellow and others. An old record book shows that in 1852 there was a meeting of attorneys in the library room of the Courthouse to formally organize the library. The new corporation was known as "Trustees of the Law Library in Cumberland County", the incorporators being Thomas Deblois, George Shepley, Edward Fox, Josiah Pierce, William Willis, John Dana and William Pitt Fessenden. The records of the library and the Cumberland Bar Association were destroyed in the great Portland fire of 1866. In November of that year Mrs. James Greenleaf presented to the association, in memory of her husband, the law library of his father, Simon Greenleaf. It was voted that "the new library which we intend to raise on the ashes of the old and of which foundations has thus been broadly laid be called the Greenleaf Law Library" and was organized as a separate entity apart from the bar association.. In 1877 the library was given many rare volumes in the will of Francis O.J. Smith. After the building of the old city hall in 1868, the library occupied rooms on the second floor over the main entrance. A fire in 1908 destroyed that building. In 1909 the library moved into the present county courthouse in rooms provided for it. The bank holiday in 1932 depleted the operating funds of Greenleaf Law Library. In the Federal Courthouse however, was an seldom used library owned by the bar association and given at the bequest of Governor Henry B. Cleaves who died in 1912. The collection of the Greenleaf Law Library, the nucleus of which was formed by an agreement signed by Cumberland Bar Association lawyers 1811, was sold for one dollar in July 1933 to the Association. A major collection was maintained in the county building in the former quarters of the Greenleaf Law Library, as was a small collection in the federal building. The federal branch library was discontinued in 1955. The Greenleaf Law Library was maintained in shadowy form for several years in a room adjoining the Cleaves Law Library, but finally transferred its remaining assets to the Cumberland Bar Association in 1940 and both libraries formally became the Henry and Nathan B. Cleaves Law Library. In 1981 the library joined the State Court Library System to serve also as the law library for the County of Cumberland. Now we are the Southern Regional Court Library Center in the Maine State Court Library System. On July 3, 1996 the membership of the Cumberland Bar Association voted to transform the library into a separate non-profit 501(c)(3) corporation apart from the Association. This action permitted the library to receive gifts and bequests to increase the endowments and be eligible for public and private grant and foundation awards. The library is open to the public during prescribed hours. Use of the library at any other time is restricted to officers of the court in good standing who are also library members ("LM"),the judiciary, and court personnel ("LM"). LMs are persons who have paid the annual library membership fee for the then current calendar year, judges, judiical law clerks, and the sheriff of Cumberland County. Library membership status and privileges, including, but not limited to, access during non-staffed hours, is not transferable. Other policies regarding the issuance of access cards may apply. To gain access to the library after regular hours, each qualified member must have a separate access card. Entry to the Cumberland County Courthouse complex is at Newbury Street. Only an LM may borrow library materials. Before borrowing any circulating library materials, as designated by the Library staff, a borrower shall sign out books in a manner prescribed by the librarian and posted in the Library. All borrowed materials shall be returned within two weeks. If another library member needs to use borrowed materials before the due date for their return, the Library staff shall notify the borrower by telephone or mail. The borrower must return the materials within the next two business days. A fine of $1.00 per business day, per item beginning the first day overdue may be assessed and be payable if any materials are not returned when due, including books recalled early by the Library staff. Furthermore, if materials are not returned within six weeks after the due date, the borrower may be assessed for and shall pay the replacement cost of the borrowed materials plus a handling fee. All fines and costs so assessed shall be paid within 30 days of the billing date. Some materials may not be borrowed; such materials shall be stamped "FOR REFERENCE ONLY, PLEASE DO NOT REMOVE FROM THE LIBRARY," or with some equivalent legend. Questions regarding circulation of particular materials should be directed to the Library staff. The Library assesses fees for services including photocopying, interlibrary loan and fees for materials that are outside the flat-rate paln including Westlaw, Lexis and BloombergLaw. Please refer to attached fee schedule. All fees pursuant to this section are payable forthwith upon use; however, a charge account may be opened for an LM or by his/her law firm at the discretion of the Librarian. Account holders are responsible for notifying the Library staff of any billing address change. All charges shall be paid within thirty days of billing. If a statement is sent and not paid within thirty days a service fee of $5.00 each month accruing from the date of the statement will be added to the balance due. If charges are not paid within 90 days of first billing, credit privileges will be revoked. To allow all patrons of Cleaves Law Library to use its facilities as comfortably and productively as possible, the following rules and standards of conduct are adopted. Patrons shall engage only in reading, researching, copying and other appropriate activities associated with the use of a law library. Use tobacco or tobacco products, alcohol or illegal drugs. Be under the influence of alcohol or illegal drugs. Constitute a nuisance to the other patrons or the Library staff by reason of offensive evidence of lack of personal cleanliness. Use the cellphones unless the patron is an LM. Bring pets or animals into the Library, with the exception of certified guide dogs. Deface, mar or in any way destroy or damage any books or other library materials, or any Library furnishings, walls, machines or other property. Enter or remain at times it is not open to the public, unless the patron is an LM. Bathe, wash clothes or clean any other items which are not normally associated with Library use. Use radios or other audio equipment except with headphones at a low enough volume not to be heard by another at a distance of three feet. Leave children under the age of ten unattended, or allow any children to disturb other patrons or interfere in any way with other patrons' use of the Library. Engage in loud or boisterous conversation or conduct. This does not prohibit carefully modulated conversation between and among patrons and Library staff necessary for the appropriate use of the Library. Physically, sexually or verbally harass or abuse other patrons or any member of the Library staff. Engage in any activity prohibited by law. Remove Library materials, equipment, furnishings or other property except as permitted by Library policy. See par. 3 below. Interfere with the appropriate use of the Library by other patrons or interfere with the Library staff. Violate usage or conduct rules applicable to the Cumberland County Courthouse. Possess firearms or other weapons. Record moving or still images and/or audio in any part of the Library or record moving or still images and/or audio of any person in the Library. Photo copies or other equivilant images shall be permitted in accordance with applicable law. Comsume food or drink without prior permission of the Library staff. Each patron is responsible for reshelving all books and materials and clearing each work area he/she uses. Each patron shall be responsible for damages, expenses, or costs he/she causes by violation of any Library Policy or rule. If any patron of the Library (an LM or any other person) violates any policy or rule of the Library, that patron's right to use the Library and to enjoy any of the Library privileges may be revoked by the Library staff or by the Board or any authorized subcommittee of the Board. Without limitation of the foregoing, any failure of an LM or a law firm of which he/she is a member to pay any sums, including but not limited to annual membership dues and fees payable to the Library in a timely fashion pursuant to these policies shall cause the LM and the law firm concerned to be subject to the revocation of all LM and charging privileges and all other Library Privileges by the Library staff, the Board or by an authorized subcommittee of the Board. Any person or law firm whose Library privileges have been revoked pursuant to these policies may submit to the Board a request that the privileges by reinstated. The decision to reinstate privileges, in whole or in part, shall be left to the discretion of the Board, or an authorized subcommittee thereof. For a request to be considered, it must be accompanied by a certificate of the Library staff establishing that the applicant has cured each violation that led to the revocation and any other violation, has paid all sums due to the Library, and is not at the time of the certification known to be in violation of any Library policies or rules. The Board or its duly authorized subcommittee, in its sole discretion, may hold such hearings as it deems appropriate in the course of considering any revocations or any application for reinstatement, but shall not be required to do so. The Library will make every reasonable accommodation to provide equal access to Library resources for all users. Library policies and rules may be revised by the Board from time to time without advance notice. Revised policies will be posted in the Library, together with their applicable effective dates. Cleaves Law Library (揅leaves�) is established solely to serve legal professionals and the public in their need for legal information. Accordingly, the Library抯 computers and internet connection are provided solely for law-related research and the practice of law. The purpose of this Policy is to serve these specific operational interests and to protect the Library抯 limited computer and administrative resources. This policy applies to all computing resources owned or operated by Cleaves including, but not limited to, all hardware, software, peripherals, networks, network components, accounts, physical and logical data, e-mail and all other data or information transmitted by such equipment (揷omputers�). This policy also applies to all Cleaves members, patrons, employees and other persons who use such computers (搖sers�). C.	Use law enforcement agencies to search and seize user logs, computers or files for law enforcement purposes. Cleaves also reserves the right to limit certain uses on or through Cleaves computers at those times and locations that Cleaves determines are necessary to regulate access, capacity and speed. Library staff may limit access time if other library patrons are waiting to use the computers. F.	Accessing web sites that can unduly burden or infect Cleaves� computers such as those sites that offer gaming, gambling, dating services, chat rooms, file downloading, web cams, high-resolution images and shells. N.	Otherwise violating existing laws or Library policies. The Cleaves Librarian may block access to those web sites that s/he determines do not provide legal information and otherwise pose harm to the Library抯 limited computing and administrative resources. The Cleaves Librarian shall also have all other express and implied authorities to implement this policy effectively. Persons printing from a Cleaves computer shall thereby agree to pay the Library $.25 per page. Any person under indictment, information or complaint for, or convicted of, a crime perpetrated with the use of a computer, smart phone, tablet or any other electronic device and/or internet connection is prohibited from using or accessing any computers or other electronic devices, either personal or owned by the Library, or use wireless access provided by the Library from any location. Violation of this Policy may result in the loss of access to the Cleaves computers, to a Cleaves membership or to the Library. Violations may also result in appropriate civil or criminal legal action. Cleaves reserves the right to amend this Policy at any time and without notice. There are numerous ways to contribute to the ongoing success of The Nathan & Henry B. Cleaves Law Library. We hope that you consider one of these choices for giving. Property Bequest. A donation of real or personal property may be left outright, or a life estate may be granted to a surviving relative. Fixed Dollar Bequest. For small bequests from highly liquid estates this is the favored option. Percentage Bequests. If an estate increases or decreases in value, this method of donating a set percentage of the estate is a good option. Residual Bequest. This type of bequest provides for relatives and friends first, and charitable causes benefit from the remainder of the estate. Outright Gift. You will not pay tax on the appreciation and will be able to claim an income tax deduction for the full value of the stock. The Library, as a qualified charitable organization, can then sell the stock without paying any taxes. Charitable Gift Annuity. You will claim a charitable deduction in the year of the donation as well as avoid capital gains taxes with this option. Also, lifetime annuity payments will continue at a reduced tax rate. Unrestricted cash donations are used by the Library for new acquisitions and capital improvements as well as operating expenses. We always appreciate the donation of new library materials. Memorial. Consider donating a classic treatise in memory of a respected colleague, or to honor the passing of your attorney-mentor. Honorary. We also suggest donations in celebration of achievement梕levation to the bench, partnership, and chairmanships are just a few successes worthy of permanent acknowledgment. Sponsorship. A special gift to the Library and the entire legal community is the sponsorship of a treatise. You or your firm provide the funds for the initial purchase, and may then choose to sustain the yearly maintenance cost of the subscription. This way, not only do you enjoy the title, but you provide the Library with a valuable resource. We welcome your used law books. Changing your specialization? Retiring? Moving? Running out of space? We抣l accept your used law books for resale to the legal community. You receive a tax deduction and a colleague gets a set of books. What could be better!? We may even add your donation to the collection. We particularly appreciate CLE materials and periodicals. Are you upgrading your office computer system, redecorating, or reorganizing? We may be able to use your old furnishings or equipment. Give us a call! If you have a paid-up life insurance policy that you no longer need, consider donating the policy and claiming a charitable deduction for the present cash surrender value. For another option, you can designate the Library the owner and beneficiary of a current policy you hold and deduct the annual premiums on your income tax return. On the passing of a friend, colleague, or loved one in the profession, many of us choose to make a lasting contribution to honor that person抯 memory. Consider contributions to The Nathan & Henry B. Cleaves Law Library. Your name and that of your honoree will be printed on a memorial book plate. For substantial donations, we will establish a separate endowment fund. We, the Directors of the Nathan & Henry B. Cleaves Law Library, after due notice and consideration, do hereby vote to create the Cleaves Law Library Memorial Fund. 1. The name of the fund shall be the Nathan & Henry B. Cleaves Law Library Memorial Fund. 2. The principal purpose of the Fund is to provide a mechanism for persons to commemorate the lives of deceased members of the Bench and the Bar by assisting the library, in their memory, in carrying out its charitable, educational, and historical purposes. 3. The proceeds of the Fund shall be used to support the Cleaves Law Library in accordance with its Charter, and in that respect to solicit donations of and accept properties, monies, or securities by virtue of any gift, grant, bequest, devise, or otherwise, and to hold, control, administer, invest, reinvest and accumulate, and generally care for any and all funds and property, real and personal, which from time to time may be given, granted, bequeathed, devised, or otherwise conveyed or made available to the Cleaves Law Library Memorial Fund either unconditionally, upon conditions or in trust for specified purposes, and to disperse such funds and property or the income therefrom in aiding, supplementing, improving, enlarging, and carrying out the purposes of the Cleaves Law Library. 4. All the assets and earnings shall be used exclusively for the objects and purposes set forth above, including the payment of any expenses incidental thereto. 5. The Cleaves Law Library Memorial Fund shall be administered under the direction of the Board of Directors of the Cleaves Law Library. A Named Fund within the Memorial Fund may be established only with donated assets of $10,000 or more per fund. A Named Fund may be proposed in a letter to the President of the Board of Directors, and must consist of at least $2,500 in cash and pledges at the time of the proposal. A proposed fund has three years from the time it is initially proposed to reach the minimum balance of $10,000. Once the minimum balance has been reached, the Named Fund will become a separate fund. If a proposed Named Fund does not reach the minimum balance in three years, the money received to date will be merged with the general Memorial Fund. A Named Fund may be established for a specific project or special purpose only with donated assets of $20,000 or more per fund. Furthermore, acceptance of restricted donated assets must be approved by the Board of Directors of the Nathan & Henry B. Cleaves Law Library in order to confirm that the special purpose is consistent with the mission of the Library. These are some of the ways which you might donate to The Nathan & Henry B. Cleaves Law Library. More information is available upon request, in confidence and with no obligation, by contacting the Library. We will be happy to assist you in your giving. The Library is a non-profit 501(c)(3) organization. Contributions are tax-deductible to the fullest extent allowed by law.